For Christmas I told Santa I wanted one thing more than anything else. Can you guess what that was? It was this Mr. Dannijo collar. Santa (*cough* mom *cough*) was so generous and got me just what I wanted. I'm pretty sure I almost cried when I opened the box. The collar really is everything I dreamed of and more. At times I find myself just staring at it. You know what may be the second best thing ever? (after this collar of course)... Fresh Direct. It really is every working girls dream. I came home from work, ate dinner and ta-da, a knock at the door and my groceries were here. I have enough blueberry yogurt to last me a lifetime now (and by lifetime I mean till the weekend). awesome outfit! omg omg omg i love that collar/necklace! i have to get one! that collar is super cute!! Gorgeous collar and cardigan. Thank you for your lovely comment. That Dannijo collar is amazing!!! That necklace is to die for. Any chance your mom wants to adopt me? I'm a fantastic daughter, I promise. that collar is pretty great! as are those sunnies and those BOOTIES!! Oh my lord! Santa really came through! I don't think I'd be able to keep my eyes off of it either! OMG that Dannijo necklace is amazing... I've been eyeing it for months. Love your collar, great combination with that tee! So amazing! 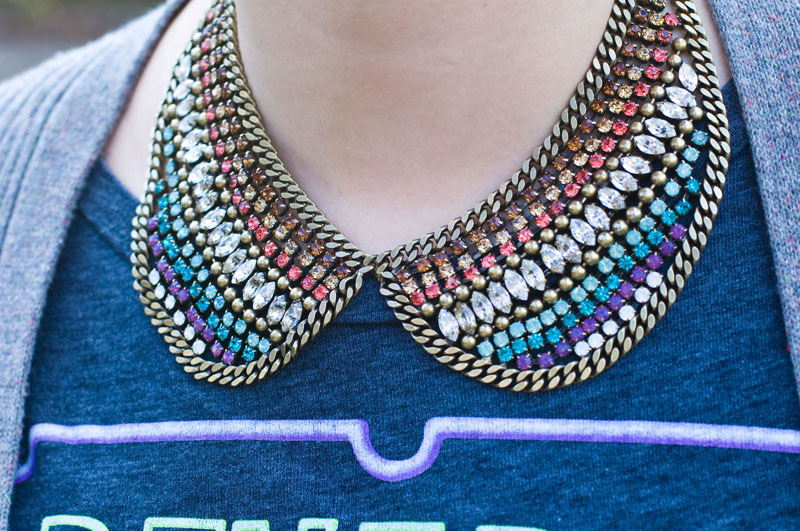 We seriously adore the collar here! I loveeee your necklace. Soooo pretty!!! love love love the collar! you must have been a very good girl this year!